The European Union (EU) is the largest economic partner of Australia: the EU is Australia’s second largest trading partner and the EU is Australia’s largest investment partner. Yet, the EU remains the only major trading and investment partner with whom Australia does not have an Economic Integration Agreement or even a Preferential Trade Agreement, either in force or under negotiation. Without one, the legal and policy systems that regulate trade and investment between Australia and the EU must function in the complexity of different levels of political economy: non-unitary internal and external market constitutions against bilateral sectoral and multilateral general agreements on trade and investment. 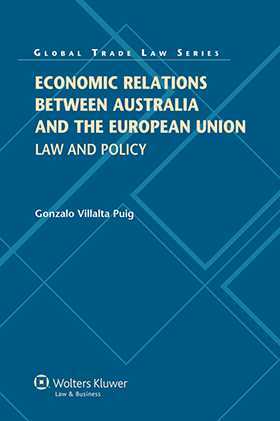 This book is the first to present a monographic study of the law and policy of trade and investment between Australia and the EU. Prof. Gonzalo Villalta Puig argues that a trade and investment agreement is necessary to remove the agricultural tariffs and quarantine requirements and to harmonize the regulatory divergences that bar bilateral trade. It is further necessary to facilitate and guarantee two-way investment. the key provisions of a prospective trade and investment agreement between Australia and the EU. Original, significant, and rigorous, Economic Relations between Australia and the European Union: Law and Policy is certain to influence the development of both the bilateral relationship and the WTO as a multilateral forum for trade and investment liberalization. It is, thus, an essential reference for lawyers, customs brokers, freight forwarders, government officials, academics, and all professionals with an interest in the regulation of economic globalization. Foreword by The Rt. Hon. Mike Moore ONZ (Former Prime Minister of New Zealand and Former Director-General of the World Trade Organization). Foreword by HE Mr Duncan Lewis AO DSC CSC (Ambassador of Australia to the European Union). Foreword by HE Mr Sem Fabrizi (Ambassador and Head of Delegation of the European Union to Australia). 2. Economic Relations between Australia and the European Union: Origins and Development. 3. Bilateral Regulation: Framework and Sectoral Agreements. 4. Multilateral Regulation: World Trade Organization Agreements. Part III. Internal Regulation. Section A. Economic Constitution of Australia . 5. Law of the Internal Market: Freedom of Interstate Trade. 6. Law of the External Market: Trade and Commerce Power. Section B. Economic Constitution of the European Union. 7. Law of the Internal Market: Economic Freedoms. 8. Law of the External Market: Common Commercial Policy. 9. Towards a Trade and Investment Agreement between Australia and the European Union. Table of Treaties and Other Legal Texts.